I can't begin to tell you how totally frustrating it is to look for tutorials, only to find that the one subject you wanted consists of nothing but unusuable "youtoob" links. I'm also well aware that there are probably fifty bazillion lists of tutorials on these forums, but they don't get bumped or replied to so they get lost, or updates to resource programs (including the CK for instance) render them no longer valid or useful. This is not a place to debate sound or hearing, it's not a place to recommend "voice to text" programs, it's not a place for "gee whiz how do you even play like that!" so don't clutter up the thread with that stuff. This is also not a place to "hate on" people who do use and enjoy video tutorials, so don't do that either. It's not a place for "help my mod didn't work", except in that troubleshooting tutorials may end up here too. If you do any of this stuff, I'll go whining to a mod to get your post edited or removed. DO NOT LIST OR LINK ANY TUTORIAL WHICH RELIES ON A VIDEO OF ANY KIND, whether or not said video is subtitled. The below list of "Useful Tutorials" will be updated appropriately, as people (including me) find or write such information. Cleaning Dirty Mods (or in-thread link here. Alchemy including how to create and add new "potions and poisons"
Help, My Shorts Are Too Shiny -- Note, this is a GIMP tutorial. There are other methods involving Nifskope, the easiest of which is just to turn the emissive and specular colours to Black. Expired's downloadable tutorial for creating a playable race. If you think of something else you'd like to see a non-video tutorial for, please say so. If you've written such a tutorial, please feel free to post your link, or even your tute, if it's short. If you've found a link for a non-video tutorial -- and you have permission to link it -- please feel free to post it. Edited by Allannaa, 10 May 2016 - 12:38 PM. theres a category creationkit with some tutorials in it and on the link skyrim some tut there aswell and here http://forums.nexusm...yrim-tutorials/ along some post, u have to look in the whole thread to find em thought. Edited by theru, 10 August 2012 - 06:28 PM. There are probably many videos posted which are completely silent, where somebody is typing in what they are doing, and essentially only using visual cues. I tend to see these as often as talking videos. I assume these are acceptable. Also, it is my understanding this thread is meant as a collection of resources, so I don't see the reason to point out that the OP has not simply found them by themselves. Edited by DaedalusMachina, 10 August 2012 - 06:46 PM. I never said I hadn't bothered to search for things. If you read my OP, you'll see that I said I'd like to COLLECT things here, not for my sole use, but for others to use and for anyone who wants it to have a quick-reference that's as up to date as I can keep it. There's no need to be nasty. And I will not only be posting tutorials of my own, but also links that I have found. Also, as posts and replies grow, I'll edit the original post, to put the links in the categories I listed, and of course, will add categories as folks think of stuff they'd like to see or work on. Feel free also to write a tute in the thread itself, if you don't have anywhere else to host it. I'll do that as an example, though after today mine will be hosted off-site, to avoid bandwidth clogging and stuff like that. Edited by Allannaa, 10 August 2012 - 08:37 PM. 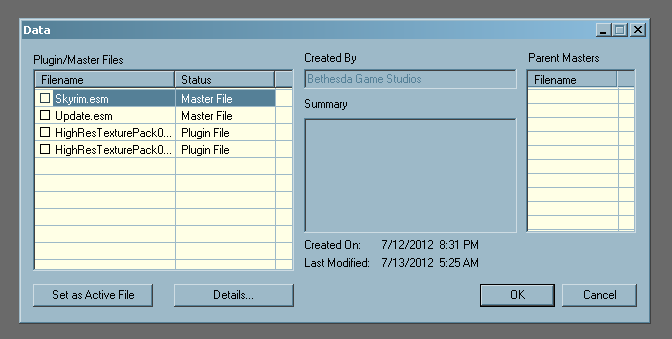 Here's a very basic quick-start of the Creation Kit, written by me, as I explored it. The CK is available for free to anyone with a Steam account, and Skyrim. Click the Spoiler button to "unfold" the tutorial. Once it's installed, open the CK. If you're not connected to Steam, it'll force you to connect, but you can use offline mode. I always do. 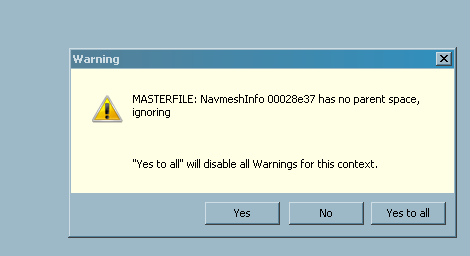 You may get a popper that says, You have not set a file as the active file. Do you wish to continue? Give your mod a name you can find easily (for instance AllaStuff) but don't put a numeral in the first position. I've forgotten why that is, but for some reason it can "break" the games. After that, the CK works a whole lot like the TESCS, but if you never used that, don't worry, the CK is still easy to deal with. Look around some. Figure out where the windows are and what they do. Keep in mind, the CK can "come apart", which is to say you can max all three windows if you like, and the "parent" window of the CK itself. MAIN TOOLBAR across the top is pretty self-explanatory. If it's not, hover the mouse pointer and you'll get an idea of what something does. 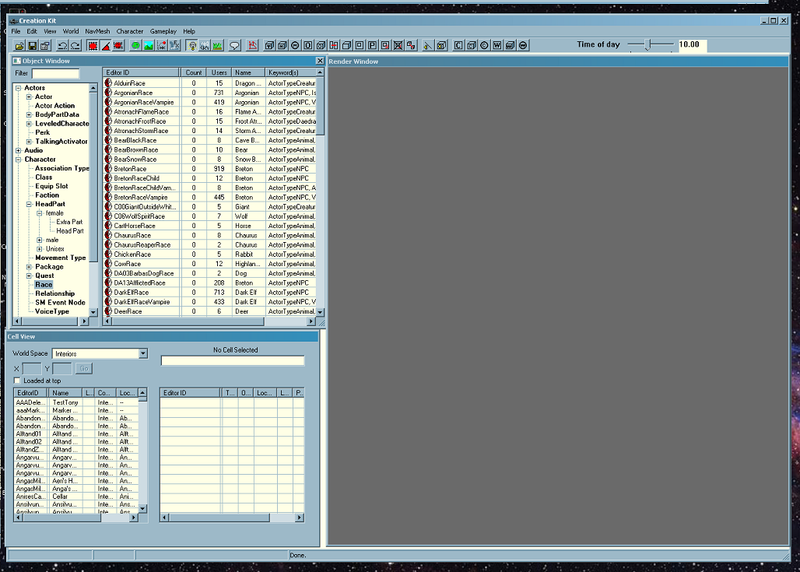 In the CELL VIEW window, click a cell. That will load it into the Render Window. Click on a reference in the right side of the Cell View window to select it. In the RENDER WINDOW, click on an item to snap the camera to it. Gridsnap will align items (such as wall bits or cave sections) in relation to the cell's grid. It won't move them up or down, it will only move them along the "compass points". An * beside an item, cell, or whatnot, indicates that the base object has been changed. Remember, always make a backup before you load your plugin, and save early and often! Edited by Allannaa, 18 October 2012 - 03:30 AM. looks like a good tut to me. Sometimes it's just faster to list it in an organized fashion. Is there some particular purpose to this magical ritual that you specify here, or is this advice just the result of some internet urban legends? 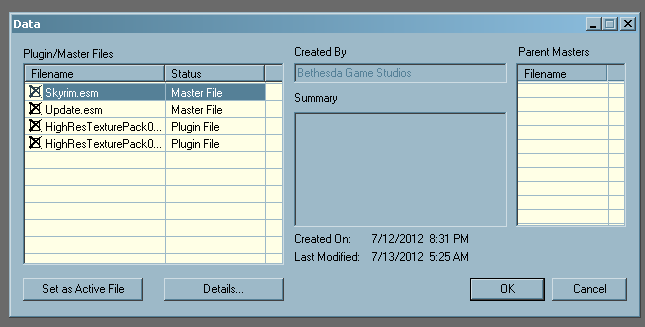 I've already made myself many many mods, and have never once even looked at Update.esm, for example. Did it not occur to you that a lot of people like/prefer video tutorials ? 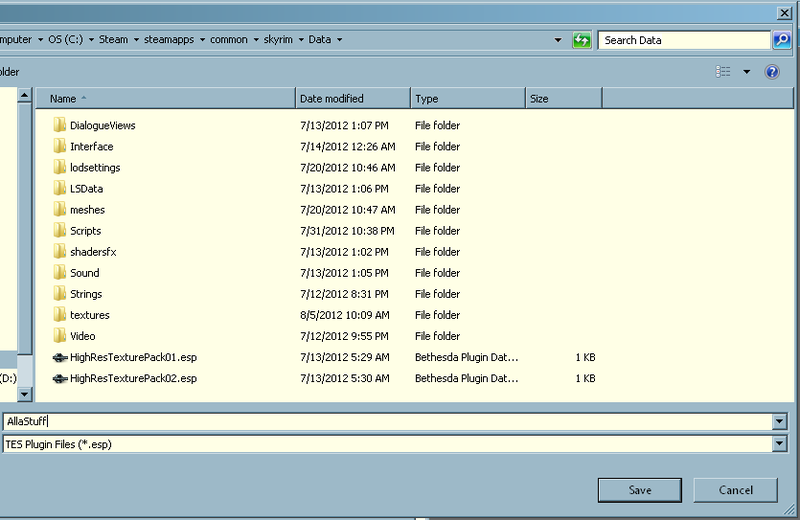 Well, the purpose is to keep one's own mod separate, and to avoid goofing up gamefiles themselves. I'm aware not everyone does this, but I'm of the "measure twice, cut once" school of thought -- also known as "overly cautious old lady". I find this makes it easier to ensure nothing goes wrong, or that anything that does go wrong, can be fixed. As for the list in the checkbox, that screenie is just an example of MY Skyrim build -- I'm sure other folks have other things in that list. The one thing we'll all have in common, of course, is Skyrim.esm. If you have a better starter-tut, or a different one, please by all means! Link it or paste it for us! The more info the better, right? Edited by Allannaa, 11 August 2012 - 02:14 AM.